Who walks out on MKR tonight? It’s Karen & Ros’ turn to cook but Court & Duncan clash with Josh & Amy. 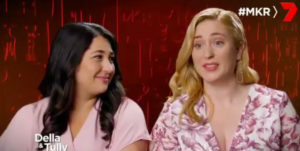 Will they stay or will they leave MKR? Here are Karen & Ros’ dishes. Karen & Ros’ restaurant is again baby-themed called “procreation”. Once the guests arrive and are seated, Tully reveals that she is pregnant. The contestants get talking. Josh starts stirring the pot. They start talking about how long Court & Duncan took to get their dishes out. Court starts crying and leaves the table. The other contestants defend her. Will Court & Duncan leave the competition? They talk about it privately and come back to the table. Meanwhile, Karen & Ros are getting their mains ready. They get them out fairly quickly. Pete has the Crumbed Haloumi and Manu has the Prawn Tart. Pete reviews his dish first. He loves the watermelon rind, and by crumbing a dry cheese it made it drier, it missed the mark. Manu’s tart wasn’t bound well with egg. He says the fusion becomes confusion. He says it is not reflective of themselves and they should stick to what they know and do it well. The mains hit the table. Manu has chosen the fish and Pete has chosen the beef cheeks. Manu begins to eat his meal and stops occasionally to remove something from his mouth. Manu says he liked the saffron sauce. He says there must of been a woody centre in the parsnip that was used in the puree as he got chunks of the woody part in his mouth and it was unpleasant however the fish was cooked perfectly. Pete says the beef cheeks were delicious and the parmesan mash was tasty and the sauce was well seasoned. Manu asks Court and Duncan what they thought of their meal and Court did not want to say, she said she was over all this and was not going to do it. She is visibly upset. Manu asks why they are angry and upset and then pulls them aside and asks to speak to them. Manu says he has felt uncomfortable at the table for the whole night. Court says she doesn’t usually hang out with people like this. Manu replied that Pete and himself have been on everyone’s side from day one. Court says she respects Manu but she is struggling. Manu says they just need to move on to stay in the competition. Everyone returns to the table and the chat with Manu seems to have calmed Court and Duncan down. Finally the desserts are out. Pete has chosen the tiramisu and Manu has chosen the chocolate mousse. Pete doesn’t look super impressed when his dish is put down in front of him. The judges taste their desserts. Pete says the texture of the cake was quite dense, it was tangy but it was not a tiramisu. Manu says his chocolate mousse was beautiful and airy and light, the addition of the crumble was very clever and a nice way to finish the meal. It’s time for the guests to score their meals tonight. Grand total score of 67 which places them at the bottom of the MKR leaderboard. Tomorrow night it’s David and Betty’s turn to cook.